South Africa’s former President Thabo Mbeki has lambasted the governing African National Congress (ANC) for turning into “a black party”. 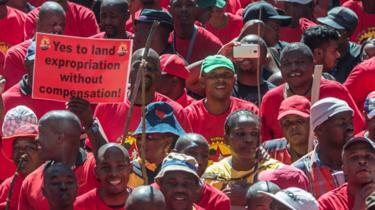 He made the comment as he criticised the party’s decision to expropriate white-owned land without compensation. The ANC was targeting white people and had abandoned its commitment to “non-racialism”, Mr Mbeki warned. The party says it is pursuing the policy to tackle racial inequality in land ownership. Nearly a quarter of a century after the end of racist system of apartheid, white people – who make up 9% of the population – own 72% of the farmland that is held by individuals, government figures show. Up until recently, the official policy was to redistribute land on a willing-seller-willing-buyer principle but this has taken a different turn since the ANC backed expropriation without compensation as a way to redress the historic inequalities. Mr Mbeki made his comments in a pamphlet leaked to local media. The pamphlet was published by the Thabo Mbeki Foundation, and is widely believed to have been written by the former president. In it, he traced the historical commitment of his party, the ANC, to non-racialism, saying that it has “stood for the freedom of all humanity, black and white”. He said that forcibly taking land from white people and giving it to black people represented an abandonment of that principle. “It is no longer a representative of the people of South Africa. Rather, as its former President, Jacob Zuma, said, it is a black party,” he stated in the pamphlet. Former President Thabo Mbeki is deliberate in his manner and in his writing. He does not easily get drawn into heated debate, rather Mr Mbeki withdraws into the study and it is there that his grand thoughts come to life. This leaked document is evidence of one of those times. While his thoughts were not meant for public consumption, they are making the rounds on social media and have divided opinion here. Some agree with the former statesman that the ANC, by pushing to take back land without compensation, has strayed from its values, while others say he is simply trying to protect white interests. The ANC is in an election cycle and wants to present a united front and many will be watching to see how it reacts to Mr Mbeki’s scathing judgement. For some that will be the test of the true character of the liberation movement. President Cyril Ramaphosa has promised an orderly, accelerated land reform process, with an amended constitution offering greater clarity. But many fear a complex, potentially explosive issue is being exploited for political gain, reports the BBC’s Andrew Harding in Johannesburg. Mr Mbeki argues that while land reform needs to be addressed it needs to be done without jeopardising the rights of different races in South Africa. He was president of South Africa from 1999 to 2008, when Mr Zuma forced him out of office. The ANC was formed in 1912 to campaign against minority rule. It took power in 1994, and has been in office since then.